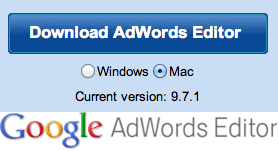 Google released a new update to the AdWords Editor - we are now at version 9.7.1 up from version 9.5.1. User interest categories: On the audiences tab, target user interest categories in addition to user lists. You can also copy audiences with user interest categories across accounts. Advanced location options: On the campaigns tab, edit settings for targeting method and exclusion method. Wi-Fi traffic: The option to target Wi-Fi traffic is available in your campaign device targeting. Target all languages. It's now possible to target a campaign to all languages by leaving the language list blank. Campaign experiments: Experiment serving status, name, start and end dates, %, and other fields now appear in the campaigns tab. All fields are read-only. Top of page bid estimates: Top of page bid estimates appear on the keywords tab, in the "Select duplicates" menu, and in advanced bid changes. Capitalization tool. Quickly change the capitalization of selected text. Go to the Edit menu > Change text capitalization. Bidding strategy enforcement. For example, AdWords Editor automatically prevents editing CPC bids in ad groups and keywords in an automatic bidding campaign. Automatic destination URL corrections. AdWords Editor replaces %, <, and > symbols in destination URLs with %25, %3C, and %3E, respectively. Exception: If % is followed by two hexadecimal digits (numbers 0 through 9 or letters A through F), such as %AB or %23, it remains unchanged. Consolidated options for copying campaign settings. "Copy campaign shell" (in the Edit menu > Copy special) replaces options for copying campaign targeting and ad schedules. Faster copy, cut, and paste (including drag-and-drop). Faster downloading for large accounts. If you have any issues, Google AdWords representative said in the Google AdWords Help thread to post those concerns there.